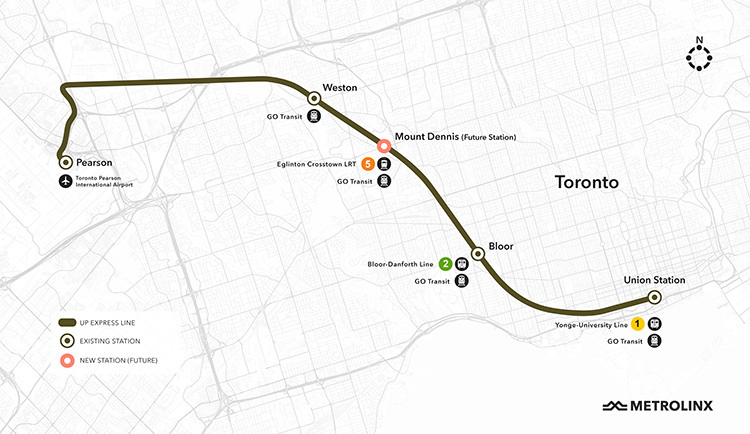 UP Express, North America’s first dedicated air-rail link conveniently connects Canada’s two busiest transportation hubs: Toronto Pearson International Airport and Union Station in downtown Toronto, in only 25 minutes. Through the use of PRESTO, UP Express offers a 30% discount to travel plus other special fares for distance travelled, for seniors, families, students and children. UP Express makes your travel experience comfortable and convenient with trains running every 15 minutes and offers amenities such as free Wi-Fi and flight information. The station is located in Union Station’s SKYWALK walkway with connections to GO Transit, TTC and VIA Rail. Union Station is also steps away from many downtown hotels, tourist attractions, convention facilities and business centres. The station is located right beside the Link Train at Terminal 1, connecting travellers to Terminal 3. Frequent and reliable train service between Union Station and Toronto Pearson International Airport, 7 days a week, 19.5 hours a day. Everyone can enjoy and benefit from this seamless connection. No matter the traffic or weather forecast, enjoy 25-minutes journey from end to end, with trains departing every 15 minutes every day. Whether you’re travelling downtown from our Bloor or Weston stations, or out of town, you can count on UP Express to take you to your destination quickly and reliably. Built with the comfort and convenience of customers in mind, UP Express offers free Wi-Fi on trains and at Union Station, retail, airline check-in kiosks, up-to-the-minute flight information screens, charging stations for all your devices and CIBC ATMs at Union Station. Travel with comfort and ease without stepping outside.